San Francisco loves a hill. And San Francisco adores a steep hill. So much so that my roommate Venessa specifically warned me that my calves were going to explode, hulk-style, as a result of walking around – pointing out her own monster calves as an example. (FYI they’re tiny, dainty little things). Risk of monster calves aside there’s no denying that a walk around your typical SF neighborhood will provide you with a satisfactory burn in the legs. One of the hills near me is the beautiful Bernal Heights Hill. If you can believe it, I’ve lived in my house for 8 months now and I can see Bernal from our deck, but I’ve never actually made it up. Ridiculous! My new year’s resolution is to get outdoors more so I decided to take myself up there for a nice walk with my other roommate Lysbet. The view from the summit is spectacular – on a clear day you get a 360 view of the city. It was fun trying to pick out our fave spots. One thing I also noticed was that there were so many more green areas that I didn’t even know existed. Plenty more exploring to be done obviously! A lot of people had the same idea as we did – we were joined by a lot of dog walkers and couples having magic moments. Bernal Hill is an amazing place to either pledge your undying love to someone or decide to go your separate ways. The walk home was fun as well. One thing I love about SF is that they put such effort into making public spaces pretty and interesting. There were so many cute little look-out points and even a slide in lieu of some stairs (see video!). A simple walk around the block can turn into a mini adventure. It was a lovely day indeed and it’s made me realise that I need to get out exploring more. 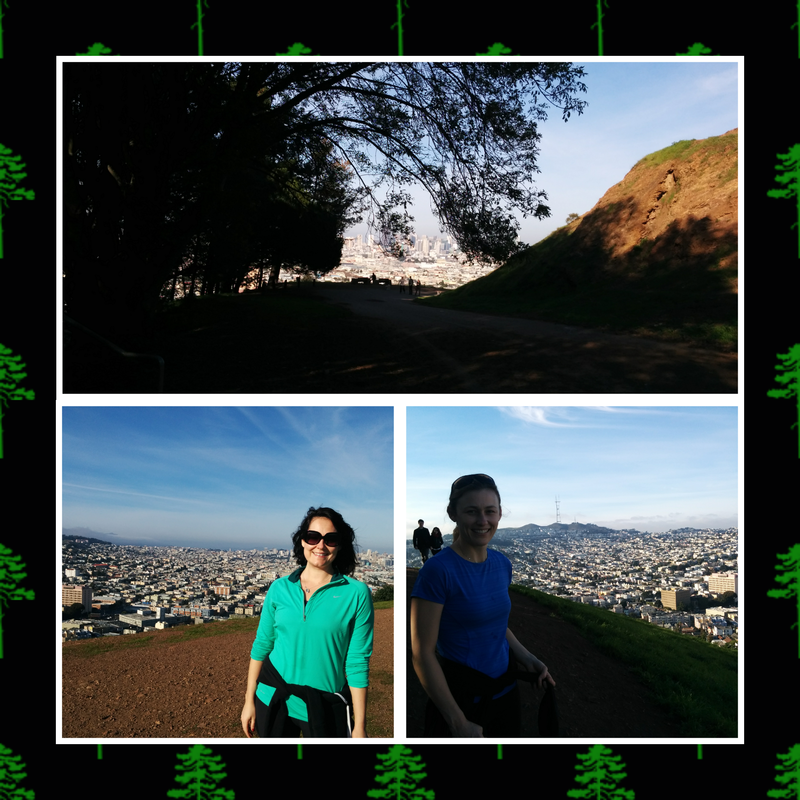 Any San Franciscans know of any other hills/green areas/fun places to explore in the city? Video of Lysbet and I going down the slide. Today was a good day. My one slight slip was another trip to Toast. I’m obsessed. My new favourite activity is to go early by myself and people watch. No major exercise – just the walk up Bernal. Great to get some fresh air though and to get your body moving. This entry was posted in health, san francisco, wellness and tagged 100 healthy days, 100 healthy days in SF, bernal heights, bernal heights hill, california, health blog, health challenge, Healthy challenge, healthy eating, hill walk, san francisco, san francisco blog, san francisco parks, SF, sf blog, wellness, wellness in San Francisco on January 12, 2015 by meeshty. Happy faces after puppy's first swim in a lake this weekend. She seems to be digging it! Bit of an upgrade from trying to paddle in her water bowl... every day.